The security services have promised they will be out in full force this week to ensure Zimbabweans go about their daily businesses unperturbed and undisturbed. The nation needs that assurance. This day last week was eerily quiet in the morning. The opposition MDC-Alliance and its NGO sector cousins had mooted a national shutdown, something they have been itching for since they collectively lost the July 30 harmonised elections. But as it soon turned out, Zimbabweans were not following their will when they stayed home, as democracy would dictate. The political malcontents had mobilised youths to barricade all roads leading to the city centres in Harare and other major urban settlements. Boulders, burning tyres and violent youths were deployed at strategic points as enforcers of the shutdown. Citizens were under siege. That meant there would be no transport too, besides the violent clampdown on anyone who tried to leave their homes. The security services looked overwhelmed. They were ill-prepared for this mob of enforcers whose assignment was to ensure the country came to a standstill to impress Zimbabwe’s political foes who sponsor them. There have been mutterings that the sad events of last week should continue this week. That should not be allowed to happen. Millions’ worth of property was needlessly destroyed last week. Innocent people, including police officers going about their duties, were attacked, with one killed. That is not the Zimbabwe we want. Those who perpetrated the violence and their masterminds must be brought to book. The message must be loud and clear that crime does not pay. A sad fact of these developments is that people are being fooled by political malcontents to believe that nothing is being done to build a better economy. There is clear determination to frustrate President Mnangagwa’s reform policies to promote both local and foreign investment. There is equally serious determination to keep Zimbabwe on the international political radar to counter the President’s engagement and re-engagement initiative to expand the country’s global reach and influence. Most important, the MDC-Alliance and its civil society and NGO affiliates not only invited sanctions on the people of Zimbabwe; they will look for every evil trick in the book to ensure they are not lifted until they get into power. In short, while President Mnangagwa is being told to reform, there has been no attempt to soften the original regime change agenda. The tinder to set off last week’s mayhem was claimed to be the increase in the price of fuel and the cost of living in general. But this sham position was exposed for what it was when only touts and unemployed youths were deployed to harass those who wanted to go to work. These abused youths are supposed to be the beneficiaries of President Mnangagwa’s single-minded focus on the economy instead of politics. The same youths MDC-Alliance leader Nelson Chamisa labelled “stupid” for their post-election violence on August 1 last year are being unleashed once again to undermine efforts to build an economy which benefits them. Instead they are being told their future and salvation lie in the hands of a single politician desperate to get into power. We can only hope that common sense will prevail this time around — youths shouldn’t be fooled twice. Rebuilding the economy was never going to be easy. The challenge is compounded when that economy is under sanctions and a part of the population wants them to stay. President Mnangagwa and his Finance and Economic Development Minister Professor Mthuli Ncube have not minced their words about the challenges ahead and the pain of reform. That is a reality we should confront as a shared challenge, not a partisan issue so we can play the blame game. 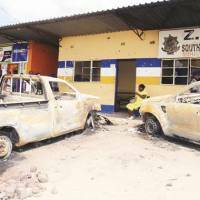 Demonstrations, shutdowns, destruction of property and general violence portray Zimbabwe in bad light to potential investors, whether local or foreign. That can only prolong the agony. That is why forces of evil should not be allowed to prevail over the national good this week. Those found on the wrong side of the law must get swift justice as a warning to like-minded economic saboteurs.